Starting in 1938, Gomez, Morticia, Uncle Fester, Lurch, Grandmama, Wednesday, Pugsley, and Thing appeared in The New Yorker in a series of cartoons by Charles Addams. After two seasons in the mid-'60s as a sitcom, then two more as a Saturday morning cartoon in the '70s, the adventures of the strange, morbid Addams family seemed destined to solely exist in illustration form. Then, after Charles Addams' passing in 1988, even the cartoons stopped—but in 1991, The Addams Family movie brought the pale gang to the cinema. Here are a few things you might not have known about the film. 1. THE IDEA TO BRING BACK THE ADDAMS FAMILY CAME FROM A CAR RIDE. Scott Rudin, head of production at 20th Century Fox, was riding in a van with other company executives one day after a movie screening. "Everyone was there—(studio chiefs) Barry Diller and Leonard Goldberg and (marketing chief) Tom Sherak—when Tom's kid started singing 'The Addams Family' theme," Rudin told the LA Times. "And suddenly everyone in the van was singing the theme, letter perfect, note for note." The next day, Rudin proposed to Diller and Goldberg that they make an Addams Family movie—and they went for it. 2. MC HAMMER WROTE AN AWARD-WINNING SONG FOR THE MOVIE. The "Addams Groove" music video played before the film during its first few weeks in theaters. The final track on Too Legit to Quit would end up being MC Hammer's last visit to the top 10 of the Billboard singles charts in the U.S. It also won the 1991 Golden Raspberry for Worst Original Song, beating out fellow nominees "Why Was I Born (Freddy's Dead)" by Iggy Pop, and Vanilla Ice's "Cool as Ice." 3. ANTHONY HOPKINS TURNED DOWN THE ROLE OF FESTER. Hopkins instead opted to play Hannibal Lecter in Silence of the Lambs (he got the role after Sean Connery was initially approached). Hopkins would win the Best Actor Oscar for his performance. 4. TIM BURTON WAS INITIALLY SET TO DIRECT. Burton had worked with Addams Family screenwriters Caroline Thompson and Larry Wilson on previous projects, but ended up not taking the job. 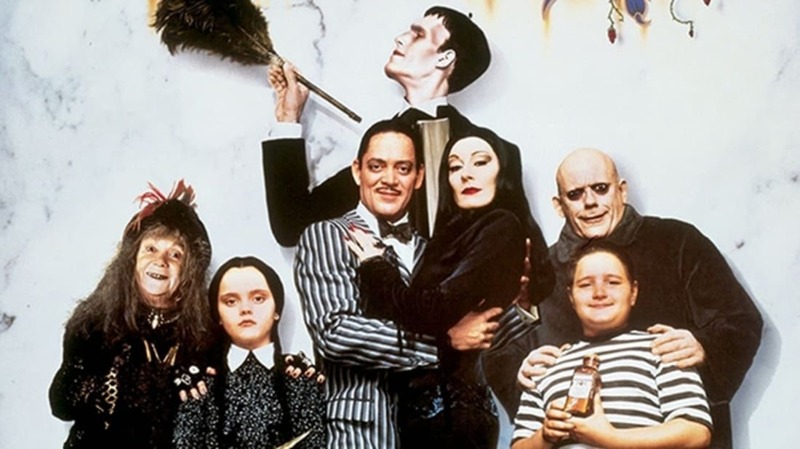 Almost 20 years later, Burton was rumored to be developing a 3D stop-motion animated Addams Family movie, but it was announced last year that he was off the project. 5. IT WAS BARRY SONNENFELD'S DIRECTORIAL DEBUT. The Addams Family was Barry Sonnenfeld's directorial debut, but he had experience as a cinematographer on films like Blood Simple, Big, Raising Arizona, Misery, When Harry Met Sally..., and Miller's Crossing. After his agent told him that he would lick a carpet if he couldn't find him a directing job within one year, he found Sonnenfeld a seemingly plum first time assignment helming a high profile movie (in less than a year). As a joke, Scott Rudin let it be known to Sonnenfeld that he wasn't his first choice by putting a different director's name on the back of the director's chair every morning on set. Some of the names that replaced Sonnenfeld's were Joe Dante, Terry Gilliam, David Lynch, and Rudin's first choice, Tim Burton. 6. SONNENFELD FAINTED DURING SHOOTING. Three weeks into directing, Sonnenfeld was talking to a studio executive who was concerned about the budget for the film when he felt a "tremendous pressure" in his chest, "as if someone was blowing up a balloon inside me," then passed out. He also dealt with sciatica during filming, and had to shut down the Los Angeles production for several days when his wife needed major surgery in New York. 7. THERE WAS A "BLACK CLOUD" HANGING OVER THE MOVIE. Owen Roizman, the film's cinematographer, quit to work on another movie shortly after Sonnenfeld's fainting incident. His replacement, Gayl Tattersoll, stopped production for a couple of days when he needed to be hospitalized for a sinus infection, and never returned. Sonnenfeld ended up doing the job himself. In front of the camera, a blood vessel burst in the eye of Raul Julia, the actor who played Gomez. These incidents led the future Get Shorty and Men In Black director to say that he felt like there was a "pervasive black cloud" hanging over the movie. 8. THERE WAS AN ACTOR REBELLION, LED BY 10-YEAR-OLD CHRISTINA RICCI. The actors were concerned about the ambiguity of the big Fester storyline in the script. Initially, it was going to be unknown if Gordon, the man suffering from memory loss that looked just like Uncle Fester, was actually Fester. The actors nominated Wednesday Addams herself, Christina Ricci, to give an impassioned plea to Rudin and Sonnenfeld two weeks before shooting that Fester should not be an imposter. Sonnenfeld remembered that the only actor to not care was Christopher Lloyd, the man playing Fester. 9. ANJELICA HUSTON WATCHED "GREY GARDENS" TO PLAY MORTICIA. Cher was interested in playing Morticia, but Huston was producer Rudin's first choice. Huston, who grew up in Ireland, was more familiar with the Charles Addams drawings than the old TV show, and decided it would be pointless to try and replicate actress Carolyn Jones' "ideal" portrayal of Morticia anyway. The future Academy Award winner turned to the 1975 documentary Grey Gardens—a movie about the aunt and cousin of Jacqueline Kennedy who lived in a deteriorating mansion filled with garbage and animal waste—for inspiration instead. 10. HUSTON HAD TO GO THROUGH A LOT TO GET INTO CHARACTER. 11. THE COMPANY FINANCING THE MOVIE SOLD IT WHILE IT WAS BEING FILMED. Because Orion Pictures had the rights to The Addams Family, they were the ones responsible for financing and potentially releasing the movie. Even though there were some budget concerns, selling the movie to another company was something Rudin and Sonnenfeld had not even considered. But three-quarters of the way through filming, Rudin was informed that Orion had sold the movie to Paramount by Hollywood Reporter writer Andrea King. Even though Rudin was also working on a movie at the time with Paramount, in addition with having phone conversations daily with Orion over The Addams Family, he had absolutely no idea. 12. "VALLEY BOYS" CUT THE BIG MUSICAL NUMBER. Initially "The Mamushka" scene was much longer, and it featured Gomez and Fester singing about brotherly love. Even though Broadway veterans were hired to write the traditional Addams clan number, most of the scene was cut because a California test audience mostly composed of 16- to 32-year-old white males didn't care for it. 13. THE STUDIOS WERE SUED AS SOON AS THE MOVIE CAME OUT. David Levy, the executive producer of the old Addams Family TV series, sued Paramount and Orion after the movie was released to surprising commercial success. Levy claimed that too many of his ideas, which were originally from his show and not from the Charles Addams cartoons, were used in the movie. Levy, who still owned the rights to the TV show, created specific character quirks and concepts that were used in the movie, such as Gomez' love of blowing up toy trains, and Thing being a disembodied hand, as opposed to being a normal background character in the cartoons. Paramount and Levy ultimately settled out of court.